GEO-KOMPSAT 2B is a South Korean geostationary meteorological satellite developed by KARI. It is one component of the two satellite GEO-KOMPSAT 2 program. The GEO-KOMPSAT-2 program is to develop two geostationary orbit satellites, the meteorological GEO-KOMPSAT-2A (GK2A) and the ocean monitoring GEO-KOMPSAT-2B (GK2B) sharing the same satellite bus. The lifetime of both satellites will be no less than 10 years. 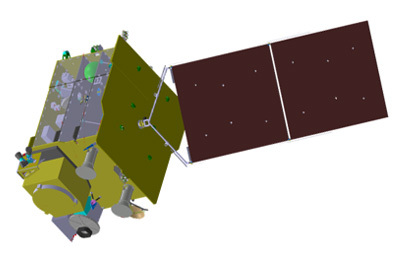 GEO-KOMPSAT-2B (GK2B) is for the ocean monitoring mission and the environment monitoring mission, featuring the Airbus Space built GOCI-II(Geostationary Ocean Color Imager-II) and the Ball Aerospace built GEMS(Environmental monitoring sensor) payloads. The satellite will be stationed at 128° East. GEO-KOMPSAT-2B is planned for launch in 2019. Due to defective parts, the launch was delayed to the 1st quarter of 2020. GEO-KOMPSAT 2B (GK 2B, Cheollian 2B) - 2020 Ko ELA-3 Ariane-5ECA with ?